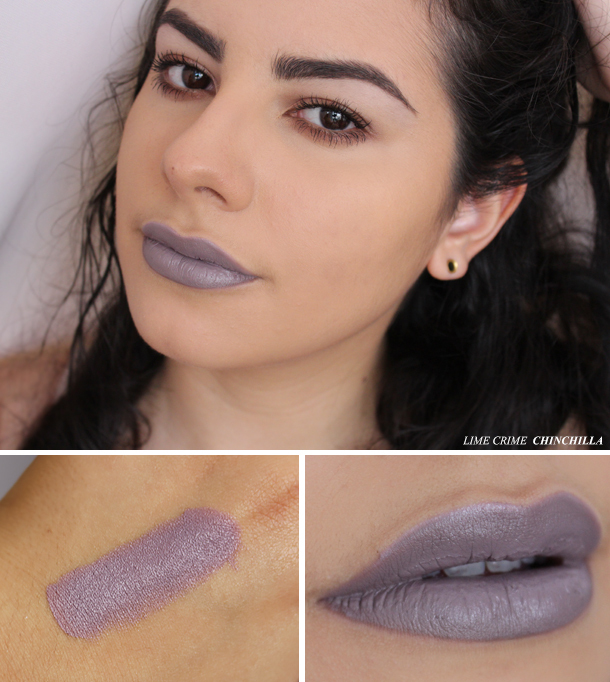 Lime Crime Lipstick in Chinchilla ($18): I had always wanted a grey lipstick but it wasn’t something that was a priority on my to-buy list. I needed to spend $15 more dollars in order to get free shipping at Urban Outfitters so I said “Why not?” and put Chinchilla on my cart. I’m glad I did because I ended up liking this a lot. The first thing I noticed once I saw Chinchilla in person is that it’s not a traditional pure grey. It has a slight lavender/lilac undertone to it which I ended up liking a lot. I had read reviews on Lime Crime lipsticks in which several people described them as drying. I don’t know if they’ve reformulated them since but I wouldn’t describe Chinchilla as dry or even matte for that matter. The texture is thin and emollient. It applies very easily and has a satin finish. Although I would have preferred a pure matte finish, this does not have a shiny finish so it’s good in my book. The pigmentation is great and the wear time is average-good (4-5 hours). I think it’s worth it to pay a little more when it comes to “unconventional” lipstick colors because they are harder to formulate. I know NYX tried to bring fun colors into the affordable mainstream with their Macaron Lippies but I was very disappointed by that formula. I found it too oily and smeary. If you also like to experiment with lip colors let me know which brands you recommend. I’m looking into trying Melt Cosmetics next but the colors I want seem to be perpetually sold out. I really like how you can literally wear ANY kind of lipstick! Every shade suits you really well! 😀 I love this colour, but I'm afraid it wouldn't suit me at all. Limecrime is such a gem! Definitley want to try out some lip products by them soon! Chinchilla looks gorgeous on you! I've always wanted to try something from Lime Crime but at the same time I'm hesitant – from what I've read online, their practices are sketchy and that makes me feel uneasy about it. I've wanted to try a few Melt lipsticks as well, namely Space Cake. This is such a stunning colour! I really love the look of their newish grey velveteen as well. Love to see a good review on this lipstick! I've been wanting to try a ton of colors from Lime Crime so thankfully it seems like the quality is worth the price. Such an interesting, different colour! You girl could pull off ANY lip colour! You look amazing. I find Lime Crime lippies to be exactly as you described… I've never tried a matte one? Amazing color! You're look so pretty! Ahh this shade is perfection! Such a "weird" and difficult colour to wear,but works perfectly for you! !I like it very much! This color doesn't seem like it would look good on anyone, but it looks beautiful on you! Wow, you pull off this lilac-grey shade so well! I think I'm probably too pale for it, but it's so beautiful on you that it makes me want to try it as well! Wow, this looks really interesting. I am not sure if will fit me though. I am pretty conservative when it comes to my makeup. Fantastic shade,thank you for this lovely review!